Early this year, yours truly opined that while Amazon.com, Inc. (NASDAQ:AMZN) was more than capable of coming up with some absurd and even alarming business ideas, the advent of physical bookstores was actually a very, very good one. AMZN stock is up more than 14% since the end of March. At the time there was only one, in Seattle, but an announcement that a second one was planned for San Diego was not only interesting news, but a glimpse into the e-commerce giant’s growth strategy. That is, by melding online and offline shopping, Amazon would continue its journey to becoming a highly-pervasive “lifestyle” company. Not everyone agreed. 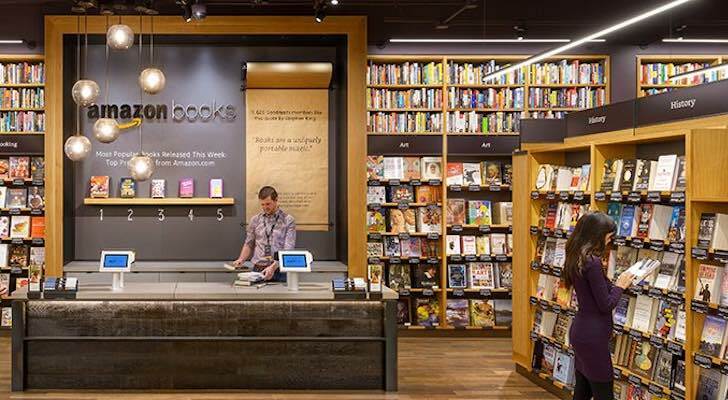 Some critics of Amazon’s foray into the brick-and-mortar bookstore realm — a category that Amazon pretty much killed — was an ill-advised move into a dead market. I’ll simply reiterate what I said then now that (as of late last month) there are 11 of these bookstores up and running and certainly more in the works… this isn’t about selling books, and if you think Amazon has been disruptive, you ain’t seen nothin’ yet. Just for the record, yes, I’m the same guy that made fun of Amazon’s drone-delivery initiative, and questioned the fiscal upside of taking on the likes of Kroger Co (NYSE:KR) and Blue Apron Holdings Inc (NYSE:APRN) by acquiring Whole Foods and getting into meal kits, respectively. Every business Amazon gets into translates into added expense and distraction from its core competency: e-commerce. Superficially those potential distractions would include the cultivation of actual bookstores. Here’s the thing: With nearly a dozen stores now open and each one representing a subtle evolution of all Amazon has learned from older ones, it’s becoming clearer what the Seattle-based company is trying to do with these locales. It’s not trying to sell books — at least not to the degree its primary competitor Barnes & Noble, Inc. (NYSE:BKS). As recent reviews of the store opened Manhattan observed, the odd/obscure book that Barnes & Noble might have on its shelves likely won’t be found on the shelves at an Amazon Books location. Amazon is limiting itself to the most mainstream, popular book titles. It’s also not necessarily carrying a lot of inventory of the books that it does stock in stores. Amazon displays books on shelves with the cover facing forward, making for a more-inviting presentation, even at the expense of efficient use of shelf space. Again, though, books are the least-important aspect of these bookstores. A closer inspection of Amazon’s newest entries in its bookstore network reveals a deep focus on the proprietary electronics the company has developed for consumers. While that certainly includes Amazon’s Echo smart speaker, that’s not all it features. These bookstores also demo Kindles, Fire (TV) sticks, and other goodies consumers might want to try before they buy. These are also the electronics that do infinitely more if you have a subscription to Amazon Prime, which offers access to tons of digital content as well as provides free-shipping. The subtleties of Amazon’s corralling of consumers into becoming Prime subscribers aren’t quite so subtle anymore either. Case in point: The only way to find the price of a particular book is by using the in-store scanners found at various locations in the store, or by using the shopping app. Both show you the price of the book for non-Prime members and Prime subscribers alike. Almost needless to say, the price for Prime people is usually insultingly lower… that is, insulting enough to make you want to pony up the $99 a year to become part of the ecosystem. And don’t think for a minute Amazon’s not thought nuances of its bookstores all through very carefully; there’s a method to the madness. For starters, Prime members spend more. Though it’s only an estimate, Consumer Intelligence Research Partners reckons that Prime subscribers spend roughly $1,300 per year through Amazon.com, which is about twice as much as non-Prime shoppers shell out at the site. And why not, if shipping is free? It’s not just the fact the Prime people tend to spend more, though. See, Prime subscription revenue may be viewed as a profit center in itself. Prime subscription revenue is now on the order of $2 billion per quarter for Amazon, and the number is still growing fast. Some contend that the only reason Amazon is as marginally profitable as it is can be attributed to Prime subscription revenue. While that’s a premise that can never be proved or disproved — as without Prime, Amazon.com may not do business the way it does now — there’s no denying Prime memberships are inextricably linked to the company’s widespread reach with consumers. 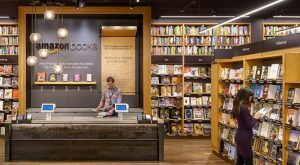 Whatever the case, make no mistake: the addition of two new brick and mortar bookstores last month lends more credibility to the idea that Amazon’s got plans for dozens if not hundreds of them in mind. With that kind of melding of online and offline consumerism, Amazon has a rather easy path to becoming the true lifestyle company it’s endeavored to be for years. See, once you’re a Prime member and the company starts to parse your shopping habits, it knows exactly which of your levels to pull. Article printed from InvestorPlace Media, https://investorplace.com/2017/09/heres-how-amazon-com-inc-amzn-bookstores-arent-actually-bookstores/.